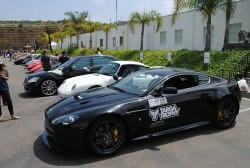 The Vantage Collection entered its highly modified V8 Vantage into the first of three Southern California rally events. The event attracted more than 100 exotic cars ranging from Lamborghini, Ferrari, Porsche, Aston Martin and Maserati, to name but a few. The Rally was a great event that brought car enthusiasts together from all over Southern California. The cars were released from the starting point in group of 5, given particular land marks to visit and photograph, and a route that ultimately ended up at the Hard Rock Hotel in Downtown San Diego.